Minions are everywhere. It seems that no matter your age, you’re enthralled by these hilarious little creatures from the Despicable Me movie series. Did you know that there’s a 3rd installment of Despicable Me coming out this summer? It’s true! 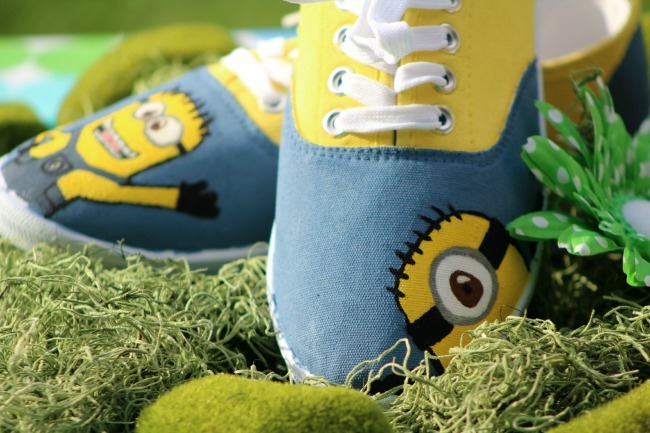 These handpainted Minion shoes are here to help celebrate the movie’s release! I can hear you now. “Haindpainted shoes?” you’re saying. TRUST ME – it’s not that difficult. If you’re not confident in your artistic skills, google a picture of Minions and use tracing paper. 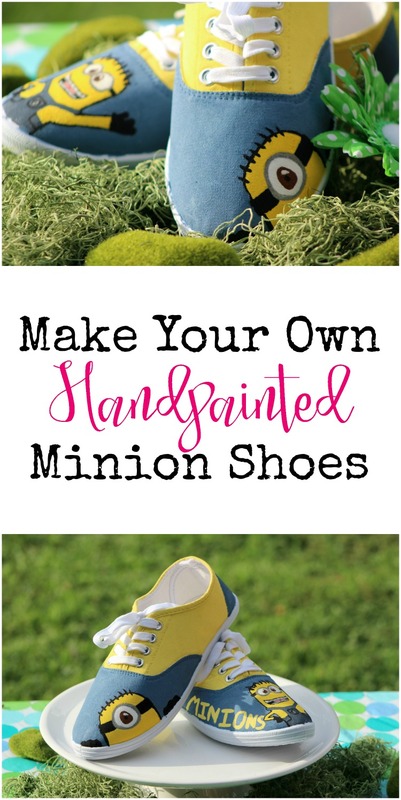 It’s seriously so easy to make these handpainted Minion shoes. 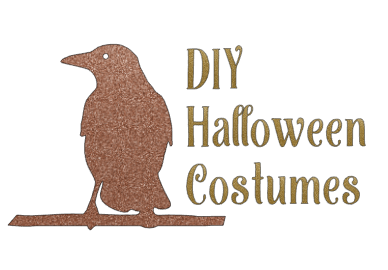 This is a great DIY project that’s tons of fun. Make them for the adults, make them for the kids. 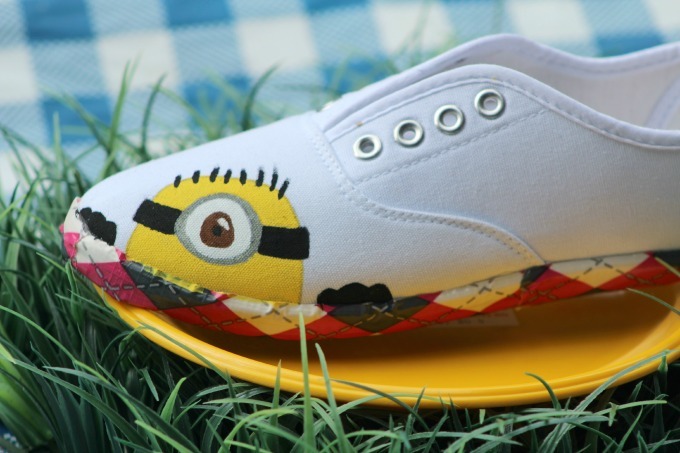 Make these painted Minion shoes for the whole family! Links may be affiliate links. They help us bring you great projects like this! 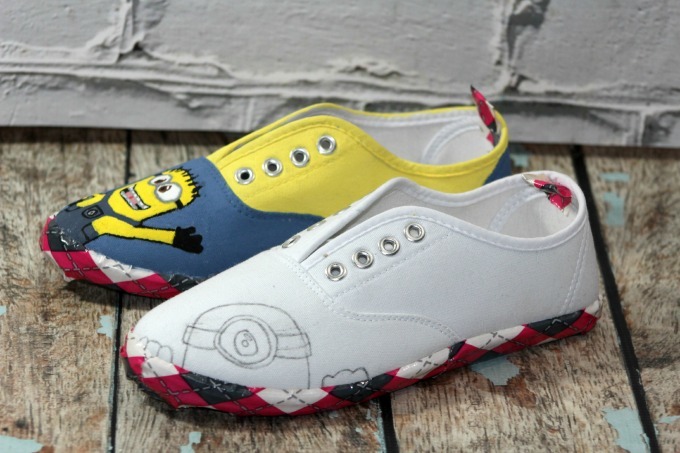 Begin by preparing your canvas shoes to become minion shoes. First, you’ll want to remove the laces from your shoes. Set aside. Tape around the sole of each shoe. This helps to keep them clean, and free of paint. Stuff your shoes with newspaper. This will keep them clean on the inside, and makes them sturdier and keep their form. Prepare your paints. If using acrylic paint, you’ll want to mix it with a fabric paint medium, which is usually right by the paints. Following the directions, add the fabric paint medium to the acrylic paint. Either draw, by hand, or trace the Minion on the right shoe and the half Minion on the left shoe. You’ll want to add the facial features and the clothing, too. Using a fine paint brush, outline the Minion in black, and fill him in with yellow. Paint the overalls grey. Add the details with black paint. Outline and color in the gloves, hair, and glasses band with black. Using black again, outline the mouth and make two grey lines on the top and bottom on the mouth. Add small white squares for the teeth. Outline and color in the grey frames for the glasses and make a button on the pocket in the center of the overalls. Using white paint, fill in the white of the eyes. Add brown for the iris of the eyes with a small white streak close to the black pupil dot in the eye. For the mouth, add a small, short line of pink. This will become the tongue. Add a small red dot in the center for the tongue. Paint the toe cap and back of the heel of your shoes with denim blue paint. Paint the saddle of the shoe (the part that goes across the top of your foot) with yellow. Set aside and let dry thoroughly. Spell out the word “MINIONS” in all caps, using yellow paint on the toe of the shoe. This is optional, and I think I kind of like them better without this step. Allow to dry really well overnight or until thoroughly dry. Overnight should do it, but if you live in a humid climate, you might need more time. You may want to spray a protective coating like Scotchgard on your minion shoes prior to wearing. These are really very cut. My granddaughters would love making these. These are the cutest things. My grand daughters would absolutely love them!